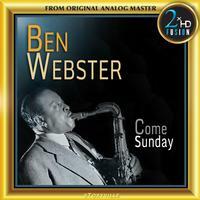 “I’ve heard Ben play in so many settings but to sit down and listen to him play a ballad – nobody who ever played a ballad does a better job than Ben Webster does on it”. These words voiced by Dizzie Gillespie hit it right on the button. The nickname ”The Brute and the Beautiful” was aptly given to Ben Webster. He became famous for his beautiful sound which gave his ballad playing a unique touch of tenderness, while his playing in faster tempos was virile and filled with growl, and when sober he was the kindest and gentlest man, witty and entertaining and the natural center of the gathering, while he was unpredictable and violent when he had consummated too much of alcohol. Despite this Dr. Jekyll-Mr. Hyde-personality he was a much loved musician and recorded a fair amount of excellent records of which most still are in stock, due to the fact that he is the best-selling tenor saxophonist in jazz.